I think this should be on the main board. Please share any recent stories of encounters that you have had with the band. Sioux City, IA in November. I finally....after many, many years of hoping....got to meet (in order) Scott, Joe, and Seth. It was a wonderful day! Words of wisdom: do NOT go to the merch table when you are high on happiness from such encounter. All reasonable control of spending money had left my body. "I'll take that, and that, AND THAT...". What's money though when you've finally had a dream come true? One time, my wife and I lassoed Scott and kept him locked up in our fenced-in backyard. He served as a farmhand for us for an afternoon before we agreed to let him go. Good times. Okay, not really. 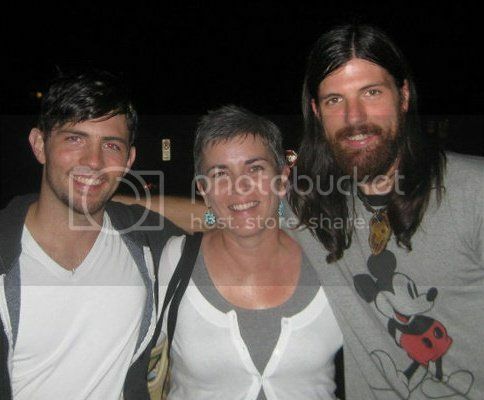 Instead, we met him, Seth, and Joe after Merlefest in 2010. They were awesome. Scott and Seth loved to chat and it was like they didn't want to leave. Hey Reiggin, I used to work with your wife at The Gazette. Before "I and Love and You" came out, she posted a live video of "Heart Like a Kick Drum" on Facebook that got me hooked on the band! I went to the School of Art at ECU the same time as Scott, but I can't clearly remember him, although I think he may have been a ringleader behind the Painting Department's "Black Goats of Death" flier war with the Communication Arts Department's "Pink Fairies of Life" for the 2001 Spring Fling. Can any other Pirate confirm? My favorite encounter was in Oct of 2010, Bethlehem, PA. I had met them individually a couple of times prior to this night. Each time I have been so impressed by their genuine kindness. This particular night I finally met the two of them together and was able to grab this photo. The memory of that night is cherished. At 2 a.m., Scott asks before leaving, if anyone needed anything else. He was quite willing to stand around and chat as long as someone wanted to, it seems. This happened last year, at the show in Grand Prairie Tx with OCMS. My wife and I took our kids, ages 12, 8, and 6 to their first ever concert. They were Avett fans by proxy. Of course we were standing gen adm and ended up in behind one row of people at the very front. I did my best to hold the younger ones up, while being respectful of those behind me, and enjoying the show myself. I made fast friends with all around me, as I'm known to do, and the kind people in front of us let us move in front towards the end of the show. The encore ended and Seth being Seth came by and gave guitar picks to each of my kids and my wife. Moments later, Mike walked up and handed out his drum sticks to them. If that wasn't enough, a few seconds later my wife has as a set list in her hands. I didn't see where that came from. I guess the bar has been raised for my kids future concert experiences. TL;DR Took kids to their first concert, met Seth, got guitar picks, drum sticks, and set list. I have sadly not met Seth or Scott, but Scott did reply to me on Twitter once, and I got a hand grab in Chicago. I've definitely met Paul and Mike multiple times, and I met Tania in Chicago as well. I FINALLY got to meet Scott, Seth and Bob ahead of their Nashville show, on May 6th, 2016. A local radio station had been giving away chance to hear the boys play a few songs in studio. I hadn't won so the morning of the show I called in to ask if they would be giving away anymore passes. A DJ answered and at first he said no then he shuffled some papers and said hey, there's one more spot, do you want me to put you down? Uh, YES PLEASE! Found out later the stations phones had gone out the night before and they weren't able to give away these last passes. I called my wife and after freaking out we rearranged our day to be able to get to the station. As we waited in the lobby the station manager came out to tell us what it would be like. He said it's going to be really tight so you will be right there among the band. Um ok! He told us that we would get to meet them and get a picture with them! They played 3 songs on air (Ain't No Man, Smithsonian, and True Sadness). When Ain't No Man started Seth jumped out of the recording booth and started clapping to get those of us that we're there to clap. YES SIR! As we lined up to meet them after the set, My wife told Bob that we prayed for his daughter every night and he seemed genuinely touched. We got in line and when our turn came we had a few minutes to chat before they took the picture. My wife told them that we were seeing them for the 17th and 18th time that weekend. I told them That I was an 8th grade teacher and that I try to indoctrinate my students with their music. It was so fun! I hugged the station manager as we left. How does one go about meeting TAB? Are they scheduled to do meet&greets before/after shows, or do they just spontaneously happen? Are there postings some place that I miss? Are there tickets specifically to meet&greet? Do you just wait by the bus & hope that they walk by? Any suggestions would be appreciated.